Happy Style Friday! I hope all of my fabulous readers have a wonderful weekend. For today’s post I’m back sharing another style shoot I hope you all enjoy. For today’s outfit I’m wearing a burgundy lace bra, black shorts, tan boots and to complete my look I’m wearing an army print jacket which I love so much. I purchased this jacket last year from TJMaxx and I am obsessed with it because it goes with anything. I hope this inspires you and keep reading for all the deets. Happy Style Thursday! I know it has been a long time since my last post however I needed a much needed break but I’m back and ready to share more style post. For today’s look I’m wearing a black lace bra and black sweats paired with black and gold slides. I hope this inspires you and keep reading for all the deets. I love getting glammed up for any occasion, but I just can’t stop myself when it comes to a wedding. It’s a time to celebrate love and romance, but it’s also a time to celebrate show-stopping outfits – as long as they don’t upstage the bride, of course! Although many couples choose to get married in the summer, where you can whip out the summer dresses and strappy sandals, it’s not so easy to choose an outfit for a winter wedding. You want to stay stylish but you also want to stay warm, so how do you strike the perfect balance? Keep reading for all the deets. Happy Style Wednesday! 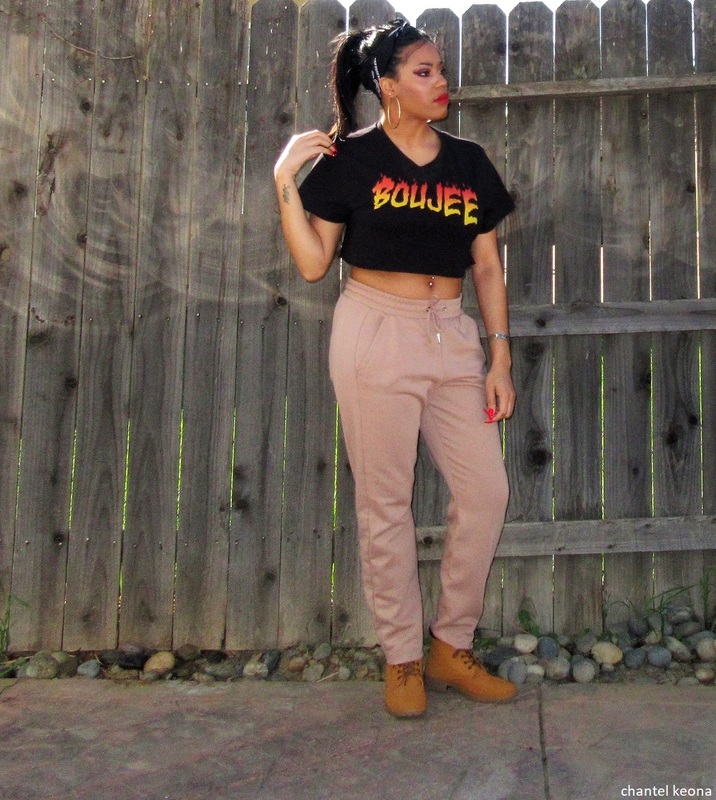 I have become a huge fan of Fashion Nova and while browsing their site I came across this black crop top that says Boujee on the front and I knew I had to have it. I paired this crop top with sweats and boots, and I put my hair in a ponytail and I completed my look with gold hoop earrings. I hope this inspires you and keep reading for all the deets. Happy Style Monday! I hope all of my readers have a blessed and productive week. Let’s start this week in style, for today’s outfit I’m wearing a black lace top paired with wide leg hunter green pants which I am so obsessed with. These pants are so cute, chic and very comfy. I completed my look with black heels, however my pants are super long you can’t even see my shoes, LOL 🙂 I hope this inspires you and keep reading for all the deets.